He's been battered, bruised and banged-up, but he's by no means a beaten man. Welcome to the black and blue world of Ian Laperriere. 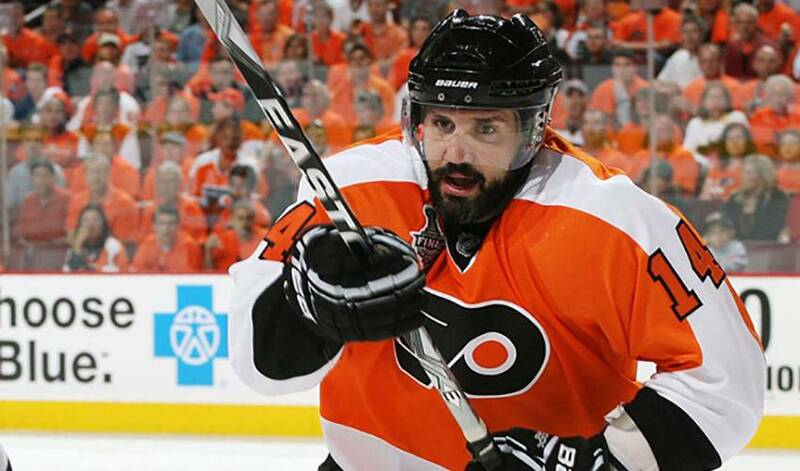 Having become one of Philadelphia's most beloved athletes for his gritty style and win-at-all-cost attitude, Flyers' fans grimaced when Laperriere found himself front and centre after a scary incident on April 22. Dropping down to block a shot from the blueline, the end result for Laperriere was a pool of blood on the ice and between 60 to 70 stitches above his right eye. But in typical Laperriere fashion, he had to be held back from practicing just days after blocking Paul Martin's slapshot in the third period of the Flyers' opening-round, series-clinching 3-0 win against the rival New Jersey Devils. “I've blocked a lot of shots in my career and unfortunately this time it caught me in the face,” Laperierre told NHLPA.com just days after the incident. “My face was a mess afterwards, but it got better every day. But it won't change how I go about things. I do what I have to do to help the team. It's not the first time Laperriere's face has bore the brunt of his penchant for blocking shots. On November 27, he was hit with a slapshot in the mouth while killing a penalty at the end of the first period against the Buffalo Sabres. Laperriere sat out the second period receiving between 50 and 100 stitches, but was back in action for the third period and on the ice the following night against Atlanta. Neither incident, however, made the 36-year-old native of Montreal gun-shy, even after he suffered a concussion, brain contusion and broken orbital bone in the incident against the Devils. So there Laperriere was, sporting a face shield, in Game 4 of Philadelphia's Eastern Conference final matchup versus with the Canadiens, doing what he does without a trace of apprehension – blocking shots and bodychecking the opposition. Taking one for the team has always been the norm for the blue-collar forward who has played 1,083 regular season NHL games. Dropping the gloves against some of the toughest players in the league, throwing everything behind his 200-pound at an opponent, or grinding it out in the corners – Laperriere has and still does it all. So, it begs the question: Is there anything Laperriere wouldn't do on the ice? It's been anything but an uneventful season for a Philadelphia team that was pegged as a major contender for Cup honours before the 2009-10 season got underway. But a rash of injuries translated into some tense moments as the Flyers worked overtime to secure a post-season berth in the final stretch. Hooking the Devils in the first round, one of the most consistent teams in the league this season, didn't do much to improve their chances according to most prognosticators. Yet somehow, in spite of losing teammate after teammate, the Flyers emerged victorious, before an improbable comeback in the second round, storming back from three games to none, to knock off the Boston Bruins in seven games. Philadelphia earned their trip to the Stanley Cup final to face the Chicago Blackhawks courtesy of a six-game triumph over the Montreal Canadiens. “Sometimes when you have so many ups and downs like we did, you find a way to play well, to believes in yourselves maybe if everybody doesn't,” said Laperriere, who signed a three-year contract as a free agent with the Flyers on July 1, 2009. “Nothing rattles us. And Laperriere's teammates believe in what he brings to the rink. For the man who fearlessly flings himself in front of slapshots, it's no big deal. It's also something Laperriere wants to instill in his own children. Just ask his teammates, fans or even his rivals, those who know Ian Laperriere is willing to put everything on the line every time he laces up the skates.